Before the Slap Chop, before immersion blenders, before the storied Cuisinart, there was the Robot Coupe. French catering company salesman Pierre Verdon spent his life traveling over the country, watching his clients dice onions, blend dressings, and grind spices by hand. Realizing the sheer number of man hours that went into these routine tasks, he invented the Robot Coupe. 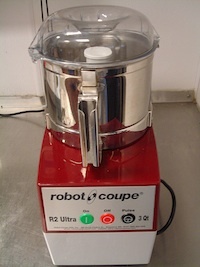 Unlike a traditional blender with a deep bowl that requires liquid to incorporate ingredients, the Robot Coupe had a shallow, wide bowl that didn't need extra liquid. Sontheimer redesigned the machine, adding safety mechanisms and improving the chopping disks and blades. He debuted the Cuisinart in Chicago in 1973, but it was surprisingly slow to catch on. Poorly marketed, home cooks thought the machine was just an overpriced blender. Sontheimer had to call in the big guns, and sent machines to food world luminaries like James Beard, Julia Child, and Craig Claiborne. Suddenly, Sontheimer's machine was hailed as a miracle. Claiborne called it "perhaps the best food invention since toothpicks." James Beard wrote an entire cookbook around it, with recipes from such famous friends as Simone Beck and Jacques Pepin. Julia Child rewrote recipes around "the wonderful F.P. machine" that enabled "every one of us to make perfect pastry dough every time." 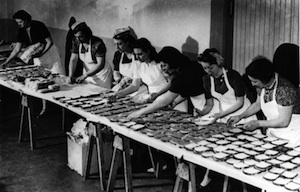 The food processor was finally a hit in American homes, and pie crusts haven't been the same since. Recipe from The Way to Cook (buy it ). Put the flour, salt/sugar, and cied butter in the container of the processor and pulse 5 or 6 times to break up the butter roughly. Add the shortening, turn on the machine, and immediately pour in the ½ cup of ice water, then pulse 2 or 3 times. 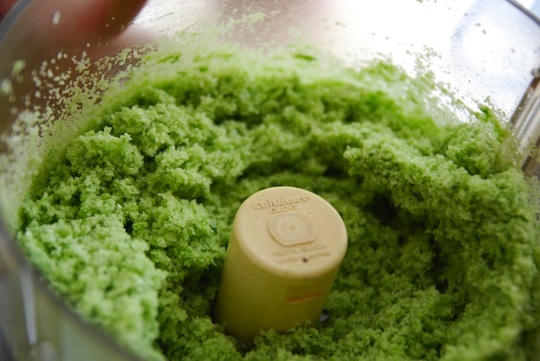 Remove the cover and feel the dough – it should look like a bunch of small lumps, and will just hold together in a mass when you press a handful together. If too dry, pulse in more droplets of water. Turn the dough out on your work surface and roughly and rapidly push egg-sized clumps of dough out in front of you in 6-inch smears across the counter. Form the clumped dough into a cake, wrap in plastic, and chill at least 2 hours. Makes two 9-inch tart shells.